Mr. Shoes Pizza, located at the end of South Avenue near University of Rochester, Strong Memorial Hospital and Monroe Community College, is home of the "Serious Pizza People". Each hand-tossed pizza is made from fresh and flavorful homemade pizza dough, covered in our secret recipe pizza sauce, and topped with the highest quality meats, cheeses, and veggies. Each and every one of our pizzas is created with the TLC that keeps our loyal customers coming back for more. In addition to great pizza, we also offer a wide range of other choices including jumbo chicken wings with homemade sauces, hot and cold subs with rolls baked fresh daily, gourmet bread bowl salads, and award winning Burger & Hot Dog Plates from the grill. Mr. Shoes offers take out, delivery, catering, and corporate account ordering for your convenience. 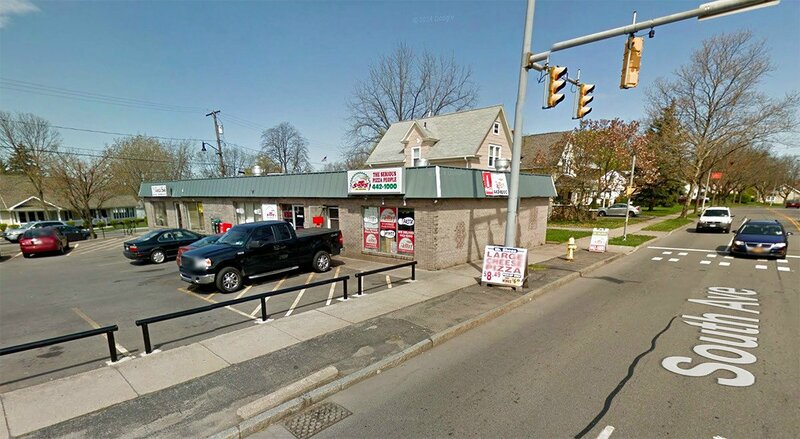 Our delivery area covers Henrietta, Brighton, the South Wedge of Rochester, Monroe Avenue, and Park Avenue areas and includes many local schools, businesses, and residents. We also have a cozy dining area, so stop in for lunch and grab one of our huge pizza slices. Order by phone at 442-1000, or use our quick and easy online ordering system. A bonus - every order placed online can earn you loyalty points in our Sole Saver Program! Points earned can be used toward payment for future online orders. Place your large pizza and wings orders easier and faster by opening a corporate account! We happily accept corporate and catering accounts with local businesses and institutions. Please contact us at 442-1000 for further information. Download and fill out this form to submit your application today!